Romeo loves the cold too. Because his breed is so trim, people worry that he is too cold. But he actually comes alive in the cold weather, will bound across terrain I have to pick my way over, his tail up and his spirits soaring. (Of course he won’t let himself get too far away. If he senses I’m having trouble, or what he considers trouble, he won’t leave my side. After having let him off the leash for a few minutes, he stops and waits for me to catch up, never more than 50 yards away. Even if I tell him I’m alright, he waits to make sure for himself.) With such a wonderful cold weather walking companion it’s easy to see why I brave those cold days with a sense of adventure. Still, it struck me funny the other day to realize that I might spend more time outside in Winter than some completely able- bodied people I know: two daily walks, and quick forays out to the barn for wood or out back to dump compost and put garbage out. But the very cold days, the ones in the teens or the single digits make very plain when it’s time to get back inside and warm up. I was having one of those moment back in November as we neared our block. My hands were frozen even swathed in gloves and hidden in my pockets. My nose hairs were frozen, my cheeks were stinging. And I was hungry. This one morning, even near noon it was so cold that I thought “I can’t be out anymore. What have I got at home that I could make something hot with the minute I get home?” Visualizing hot food on the stove was helping to keep me warm as we moved. Of course, if you read this blog at all, you’ll know I had millet on hand. And lentils. Good, no need to presoak those. This Slow Miracle foodie started channeling my own version of Jeff Novick’s fast food sensibility and took mental inventory of what frozen veggies I had in the freezer: green beans, spinach and–score!–some frozen butternut squash cubes! And there was a big “box” of strained tomatoes in the cupboard. A hot meal was in sight within the hour–or less. Just the thought of it made the sound of my Yak Trax grinding on the icy snow as we clipped along seem to have a little more zip. But not too much. One foot has to be all the way down before the other one comes up, so as not to slip. Saute the onion and carrot for about 5 minutes, until the onion is translucent. Add seasonings of your choice. Add everything else but the spinach, grated garlic and nutritional yeast. Bring to a boil, then cover and simmer on low for half an hour, stirring occasionally, until lentils and millet are cooked and soft. (I just taste them to tell.) Turn off heat. 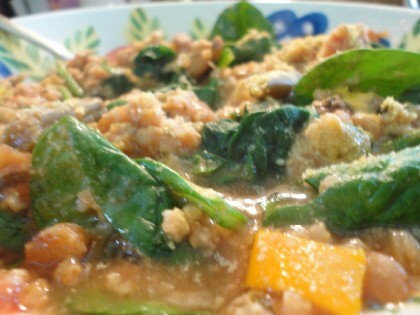 Add spinach, grated garlic and nutritional yeast, if using. Stir into hot stew, cover and let sit for a few minutes. Serve in large bowls with extra garlic and/or nutritional yeast or oregano. Notes: These vegetables are just a suggestion. Other ones that are good in this are red cabbage and cauliflower. Use what you have. If you don’t have strained tomatoes, you can certainly used diced or crushed, the stew will just have a slightly less overall “red’ tomato hue and taste to it. This makes a lot, so if you are not feeding several people at once, you’ll have leftovers. The millet will absorb most of the liquid as it sits. What I like to do when I reheat is to spoon a portion out into the steamer and steam it with some fresh greens, put all that into a bowl and then ladle some of the steam water (which I season with garlic granules) over it, making a thick “soup.” A little extra garlic or oregano maybe, a shake of nutritional yeast or ground golden flax or both on top. The steam water reactivates the strained tomato taste. So leftovers are pretty darn yummy. I finally faced blog facts and realized I have so many recipes with millet as a major player that it deserves its own category. So now there’s a category called “Millet” on the blog where you can find all the nifty things I’ve dreamed up to do with millet so far. Just reading your recipe made my mouth water! Love that you have a Millet category, yum. I recently learned that millet was really good for people with Diabetes so I’m on a quest to find more recipes. You have made it so tasty and easy for us, thank you! Thanks, Marcia! So glad you’re happy with the recipe and the new millet category. To me, it really is one of the ultimate healthy comfort foods. Enjoy! I love your website. I love your recipes. I love your writing!! 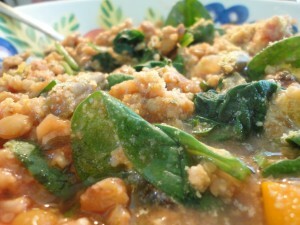 I am trying this soup this week! 🙂 Thanks for being so real! Maria, this looks so good!! It’s rare that I immediately print out a recipe, but I just did–I’ll be making it this weekend. I’m a bit of a winter-hater (I’m working on changing that), but this looks like just the thing to warm up a chilly day. Thanks for posting! Thanks, Lee! I hope you like it. It’s easy as can be, and quite adaptable to leftovers. Even those of us who love Winter start to hate it just a little when it’s still snowing in March. . .hope this warms up a chilly day for you!! I need to start utilizing millet more! This looks so warming and delicious. Perfect for the chilly days. I have been standing by the window watching a beautiful, shimmering moon tonight. So wondrous, peaceful. I enjoy millet too and good jewel colours shimmering in and around my food. It is good to have light and joy in the darkness we have all winter. The tastes I get seem almost like a bonus.